Rainbow Milk is a relatively new experiment to me. I was first introduced to it via a Facebook post of a friend who was complaining about the fact that it didn't work which, of course, made me curious. If you haven't seen this experiment before, essentially blue, red and yellow food color is dropped in a triangular shape in a bowl of milk. 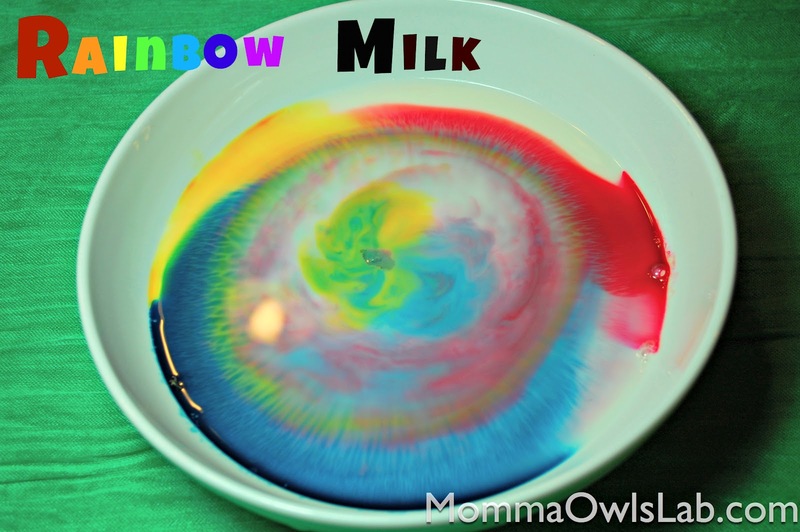 Dish detergent is then added to the middle and the food coloring starts to move across the milk, creating rainbows. The reasoning behind it is a bit complicated (I'll talk more about it later), but for young kids its a great way to explore a little about what makes up milk. You could also talk about rainbows, color combination and surface tension - all in one small experiment! I have to admit that I didn't understand the connection between Oobleck and Dr. Seuss until recently. The oobleck namesake is a delightful Seuss book named, Bartholomew and the Oobleck. (Although, as my friend suggested, with a whimsical name like "oobleck", I probably should have guessed.) I don't know that my high school students would have been that impressed with the connection - although they were at a school for the arts, so they may have actually enjoyed it. But I digress. Bartholomew and the Oobleck is about the arrogant King of Didd who was tired of only having four options fall from the sky: rain, sunshine, fog and snow. Against the advice of Bartholomew, his page boy, he asks his royal magicians to concoct something different. After thinking for a bit, the magicians suggest oobleck, which delights the king. "Why, I'll be the mightiest man that ever lived! Just think of it! Tomorrow I'm going to have OOBLECK!" The next morning when the oobleck starts falling from the sky, Bartholomew quickly realizes what a problem it is going to be. He attempts to enlist help to warn the people of the kingdom, from the Royal Bell Ringer to the Royal Trumpeter, but the oobleck gums up the bell and stops up the trumpet. Eventually as the oobleck grows from tiny drops to blobs the size of footballs, the king becomes stuck to his throne and realizes that maybe oobleck wasn't such a great idea after all. Once Bartholomew forces the king to accept responsibility and apologize for his mistakes, the oobleck magically disappears. We were able to find the book on the shelf at our local library to enjoy. We read it after we had made the oobleck and of course the first comment was, "But, Momma, the oobleck is supposed to be pink!". I explained that we could have made it any color we wanted. The book is a little on the long side for my younger one, but I think they both enjoyed the reference to oobleck and anything from Dr. Seuss, with a decent message to boot, is a good thing in my book! Welcome to our first experiment! This is an old standby of mine; I first did it when I was teaching Comprehensive Science at Newark's Arts High School right after I graduated from college. It was at the beginning of the year and we were talking about the phases of matter. I wanted something to capture their interest (and messy things tend to do that!) and also where we could discuss some of the basic principles of science investigation. (At that point, I didn't have any textbooks so I was flying a bit by the seat of my pants, but that's another story.) The kids loved it; the janitorial staff, not so much (although I tried to make it up to them later with baked goods). One thing I want to emphasize as we work on some fun science experiments with little ones is the skill of communication. My high school students were probably (very) sick of my saying this, but the most repeated line in my classroom was, "Support your answer with evidence". In order to do that, the experiment had to be well documented including both quantitative (numeric) and qualitative (word) observations, procedural information, drawings, questions and any other findings they had made. At the young ages of my girls, I'm obviously not looking for the same level of documentation, but I figure it is good practice to get them started drawing pictures of what we are doing, some simple bar graphs (I'm envisioning some fun M&M counting experiments after Halloween) and, for my older one, a chance to practice writing. It also is an easy thing for the girls to show their daddy when he get's home, "Look what we did, Daddy!". To accomplish this, I looked around the house and gathered some materials I already had on hand (I didn't really want to go out and buy stuff), including: 6" x 9" foam sheets, foam letter stickers, and a 1/2" spiral binding for my Zutter Bind-It-All. I also found some penmanship font on one of the free font websites and made a simple lab sheet that I printed front and back, about 20 for each book. I used the foam because I was hoping for something a bit water-resistant, but if you want to make a journal then you could easily use card stock as the cover. Here are some pics of the finished books. I've already made some improvements of the lab sheet (penmanship font at top for title, options of both 3 and 4 lines under the drawing/graph area), but for now these will do for the girls. UPDATE 11/30/11: I think I've figured out a way to provide a direct link through Google Docs. Don't worry: you don't need to have an account and you don't need to sign in to any file sharing service. This link should take you right to the pdf. There are two pages - one with 3 lines for writing and one with 4, depending on how much space your child needs. Let me know if you have any problems and, if you use it, and you have any suggestions for improvement! Thanks! Welcome to Momma Owl's Lab! I've been meaning to start a blog for some time. It seemed like the perfect combination of lots of my interests. I like to write - although I am by no means an expert. I love science - and while I was a biology major in college and I've taught a variety of science courses at the secondary level (everything from biology to earth science, middle school science to even some physics and astronomy), I am by no means an expert at that either. And, I really love to share things I've learned - must be the teacher in me. But the whole blogging thing scared me off for a long time. Yup, definitely not an expert! So, what finally was the tipping point? My two young daughters (ages 3 and almost 5) are both in preschool this year. So part of it is that I actually have a small block of time on my hands, at least for a bit. And, let's be honest, I'm avoiding having to clean my house. (Ha!) Seriously though, I love teaching science and I miss the intellectual stimulation and creativity that comes along with it. I constantly "see" the science in everyday things and try to share it with my kids whenever possible. And, I also figure that creating a blog would give me a more structured environment where I can share some interesting and easy science things to do with kids on a regular basis. Of course, not every child will become a scientist when they grow up and I have no intention of molding my girls into one necessarily. (At this point, my older one exhibits way more drama than could ever fly in a science lab (I blame my actress sister) and my younger one has definite engineer tendencies - if she doesn't become a fashionista first.) However, the skills that are developed from a strong science mind extend so much farther including developing strong analytical minds and creativity. The television and periodicals constantly announce that our students as a whole are less able to think outside the box or problem solve than those of a generation ago and the current state of "teaching to the test" isn't helping in that arena. Besides, science is a fun way to reinforce skills in other areas such as math and language arts! Okay, enough of my personal philosophy, let's get to the fun stuff! We'll do a weekly science and nature activity. Along the way, we'll probably try our hand at experimenting with other things like crafts and cooking. After all, what is parenthood but one large, hopefully well-designed, experiment?